Heinz Steiner is the Principal Consultant and Business Analyst responsible for Business Intelligence at Trivadis, a market leader in Germany, Switzerland, Austria and Denmark in the fields of IT consulting, system integration, solution engineering and the provision of IT services focusing on Oracle and Microsoft technologies. 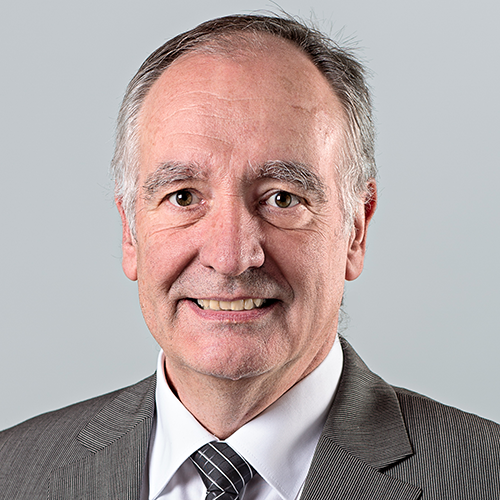 Heinz Steiner is an expert in accounting and controlling, giving lectures at universities of applied sciences and serving as an examination expert for business IT specialists and experts in accounting and controlling. He is well familiar with the demands of business management in various industries and organizations. At Trivadis, Heinz is responsible for Business Intelligence as the Principal Consultant and Business Analyst. In addition, he also serves as a discipline manager for BI-CPM regarding BI strategy, information design, and Corporate Performance Management. Before joining Trivadis, Heinz served as Managing Director of MIK AG in management communication. He has worked over 20 years as a BI consultant for the installation of controlling systems and management information systems. 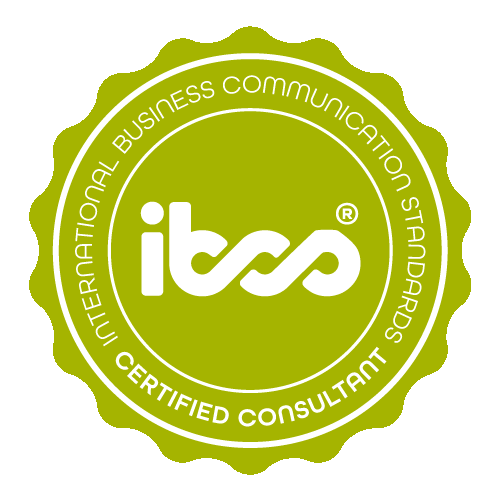 Heinz Steiner has successfully completed the IBCS® certification for successful design of reports and presentations at the HICHERT+FAISST IBCS Institute in April 2012. These work samples illustrate how the IBCS® notation can be implemented using the Bissantz DeltaMaster. 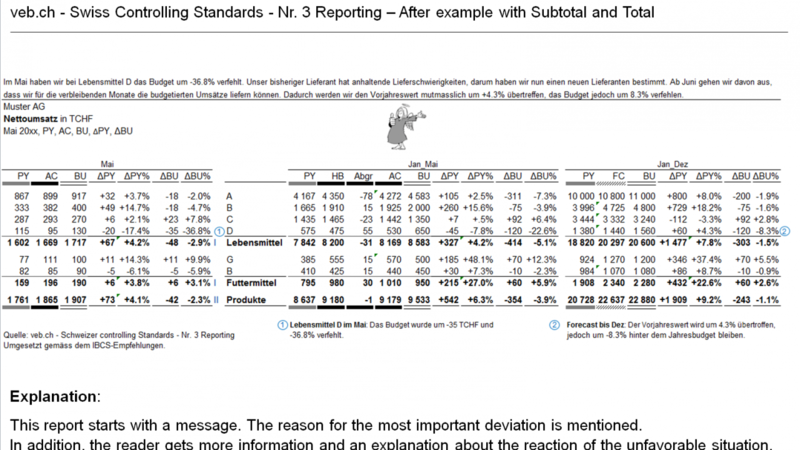 With DeltaMaster, Bissantz implements information design with regards to post processing-free reporting via graphic tables. Its requirements of information density, uniform notation, and the omission of decoration and redundancy are congruent with the SUCCESS formula of IBCS®. Even if DeltaMaster is unable to implement the IBCS® notation precisely down to the last pixel, it does enable the implementation of these requirements to a large extent. The advantage of DeltaMaster is that standard reports can be generated from these analyses, to a large extent automatically. Pivot table This analysis was defined as a pivot table, which corresponds to the standard functionality of DeltaMaster. 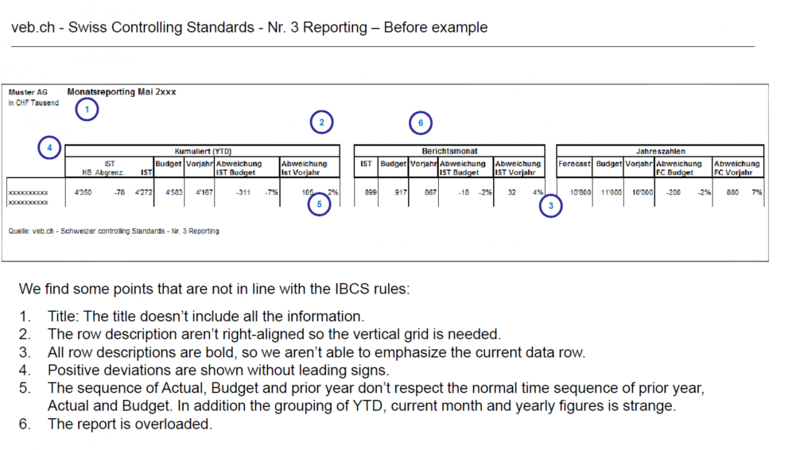 The left-aligned column headers and the gray shades used for the data types do not adhere to IBCS®. 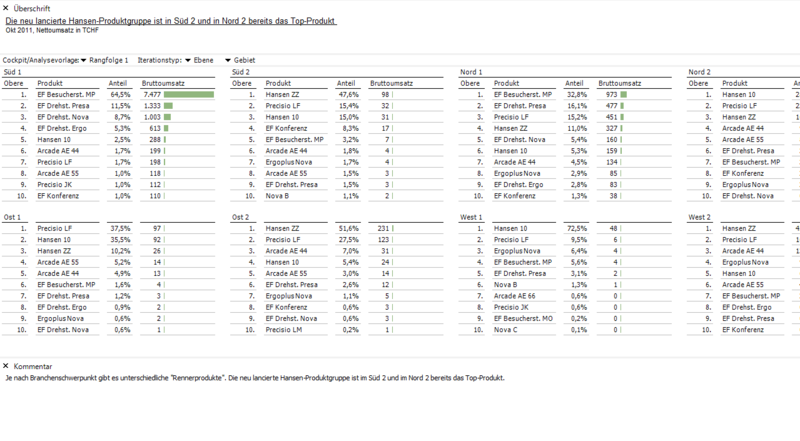 FlexReport With FlexReport, analyses can be adjusted to define the column headers and formatting in accordance with the notation concept. The disadvantage of FlexReport is that additional time and effort is required for this adjustment, compared to the automatic formatting in the pivot table. Bar chart This evaluation analyzes product groups by market region. 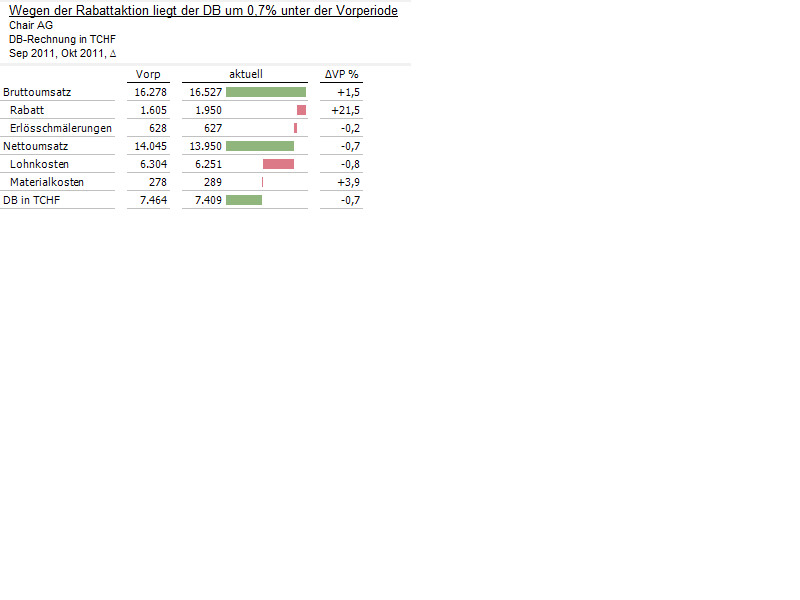 The bar chart can be scaled either on an individual or global basis. 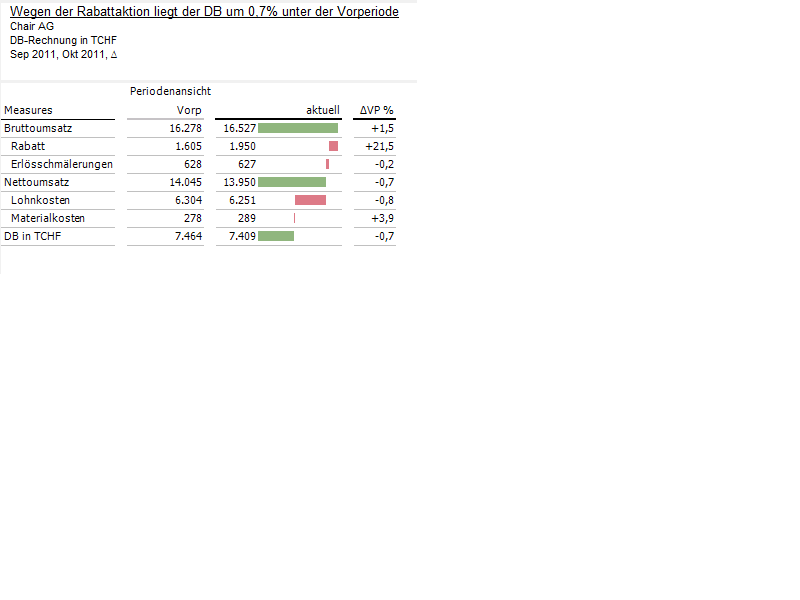 A concentration of risk in Market South 1 with the product EF Besucherstuhl MP becomes evident with global scaling. 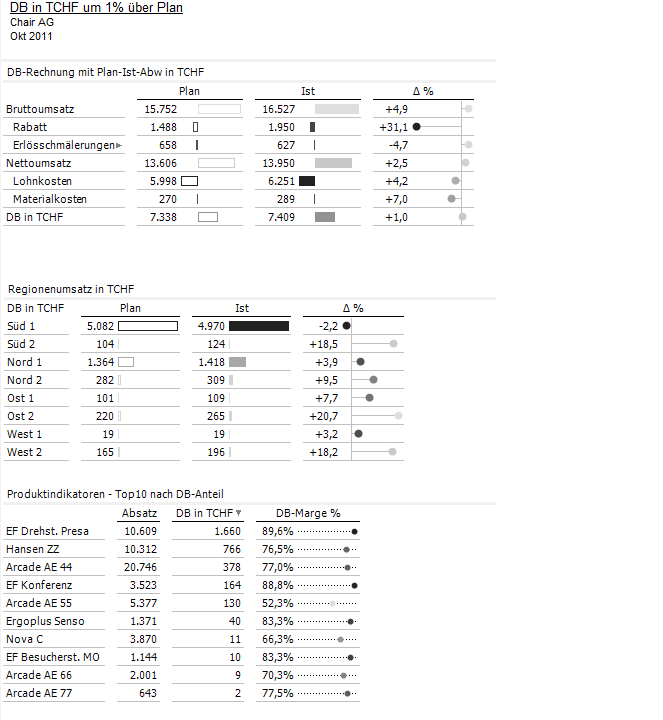 Dashboard Various analyses can be combined into one dashboard. Trivadis is a market leader in Germany, Switzerland, Austria and Denmark in the fields of IT consulting, system integration, solution engineering and the provision of IT services focusing on Oracle and Microsoft technologies.